Cagney is older and meaner than ever as Jarrett, a remorseless mad-dog killer with a severe mother complex and more than a touch of insanity. Jarrett has frequent debilitating headaches brought on by some unnamed trauma that only Ma can soothe. The actor is an untamed hurricane in this role, swaggering one minute, having a complete meltdown when he gets news of Ma’s death the next. He’s at his best when he’s totally unhinged, cold-bloodedly ventilating the car trunk containing a would-be traitor with bullets, knocking spouse Verna off her chair, and the spectacular fiery finale where his madness engulfs him as much as the flames, delivering that immortal “Top of the world” line with gusto. Cagney’s Cody Jarrett is dangerous and unpredictable, a man to be feared, and that thread of fear permeates the film. The women in Cody’s life say a lot about the kind of man he is. Margaret Wycherly is chilling as Ma, a far cry from her loving mother in SERGEANT YORK. Based loosely on Ma Barker, she’s been a criminal all her life, and has groomed her boy to be as ruthless as herself, if not more so. Virginia Mayo as Cody’s wife Verna is just as much a sociopath as he is, a duplicitous woman without morals who doesn’t hesitate to take up with Cody’s lieutenant Big Ed when her man goes to jail. Verna will lie and backstab to get her own way, but she’s deathly afraid of Cody’s wrath, letting Big Ed pay for Ma’s demise even though she pulled trigger that killed the older woman… shot in the back, no less! Cody and Verna are a match made in hell, and Virginia Mayo, who was one of Warner’s biggest stars at the time, received above the title billing just below Cagney. Both should’ve been nominated for Oscars. 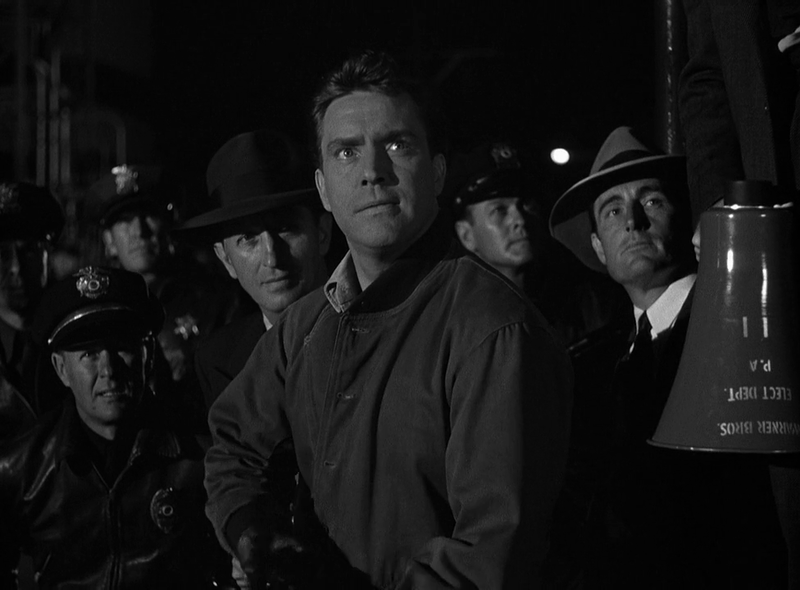 Edmond O’Brien plays T-Man Hank Fallon, who goes undercover as convict Vic Pardo to try and gain Cody’s trust. It’s a tricky part, but the always reliable O’Brien pulls it off. Steve Cochran is his usual menacing self as Big Ed… just not as menacing as Cagney! Another old reliable, Fred Clark , is on hand as ‘The Trader’, brains behind Cody’s crimes. And the Familiar Face brigade is out in full force – say, isn’t that young Robert Foulk? Omigosh, there’s Claudia “ROBOT MONSTER” Barrett! That guy looks like the butler in SON OF FRANKENSTEIN! I could go on, but you get the idea, so happy hunting! 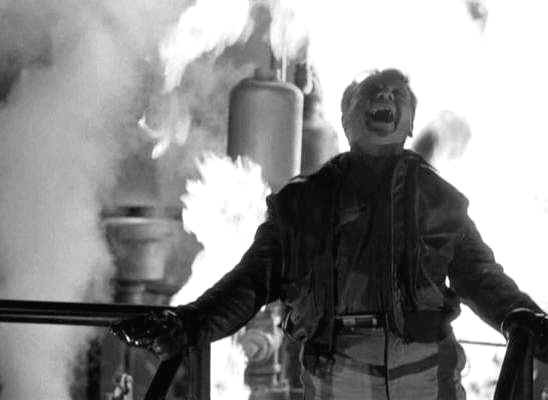 Raoul Walsh’s muscular, masculine direction makes WHITE HEAT even tougher. Walsh had success in the gangster genre before, helming Cagney’s THE ROARING TWENTIES and Bogart’s HIGH SIERRA, but he was one of those equally adept in any genre: silent classics like THE THIEF OF BAGDAD and WHAT PRICE GLORY, period pieces (THE BOWERY, THE STRAWBERRY BLONDE), westerns (THEY DIED WITH THEIR BOOTS ON, COLORADO TERRITORY), war dramas (DESPERATE JOURNEY , BATTLE CRY). This is the third of four films Walsh would make with Cagney, and a fine coda to the gangster cycle. 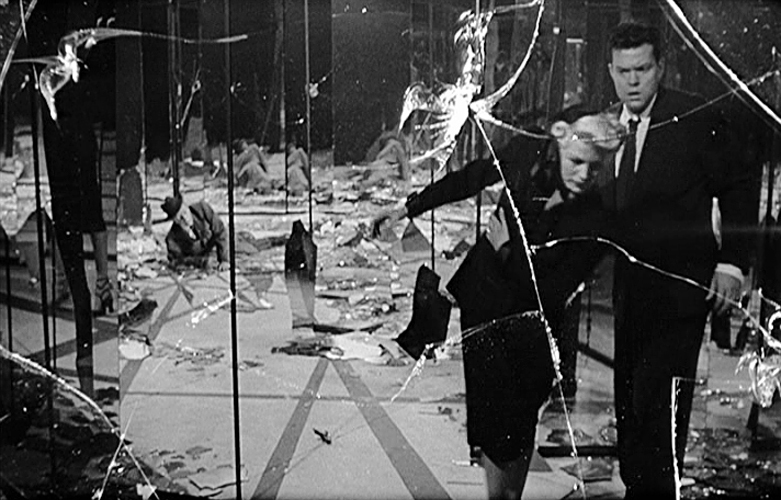 WHITE HEAT is a classic in every sense of the word, a movie that absolutely lives up to its reputation. Such a powerful film. 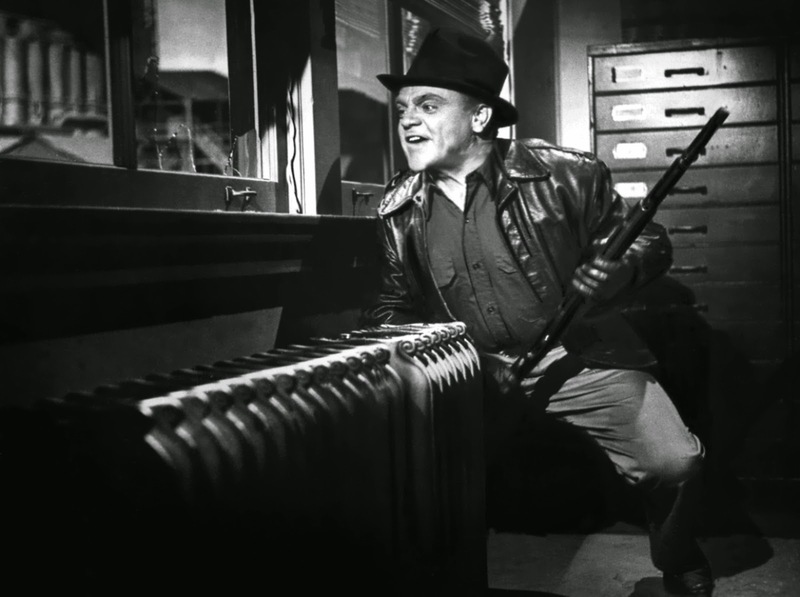 Nobody ever did rage and insanity quite like James Cagney, he was such a convincing actor. 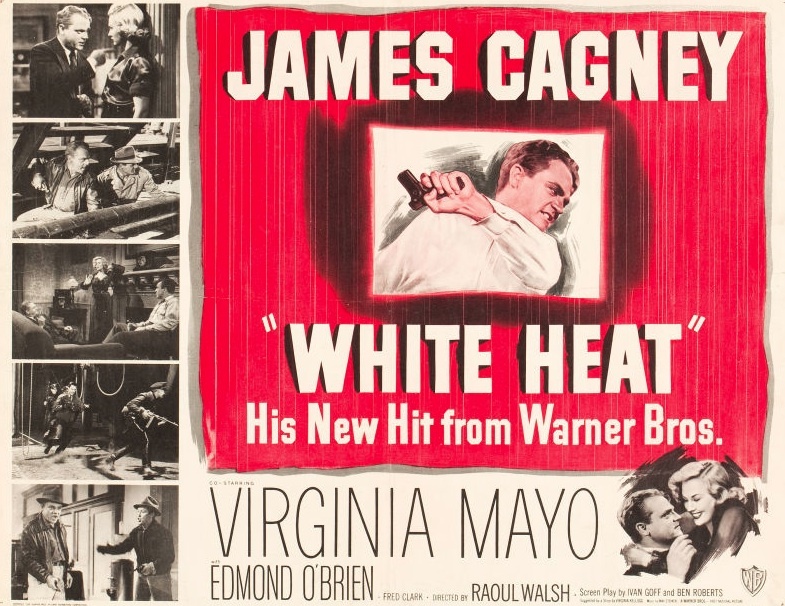 He’s so good in so many films it’s hard to pick a favorite, but “White Heat” would surely make the list! Absolutely! He was so good in everything he did. I also love him as a dancer and feel that his dance skills don’t get focused on as much as his acting and gangster roles do. No doubt! I love the routine he does with Bob Hope in “The Seven Little Foys”! That’s a fab sequence. Also love his tap sequence on the boat dock in Yankee Doodle Dandy, plus that crazy tap down the stairs in that film. I only watched it last week Gary. Jeepers creepers what movie.. The whispers down the line in the mess hall to find out his bad news setting him off into pure rage central was another of many brilliant scenes. Loved his Trojan Horse speech and that “Do you want some air” line before firing into the car boot. Oh he was devious. Brilliant performance. Hope to do a post myself soon. Previous PostPrevious Cleaning Out the DVR #20: ALL-STAR PRE-CODE LADIES EDITION!